Texts: K. Birtacha, H. Gounali, C. Kirpotin. English translation by Cox and Solman. 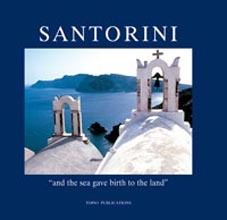 Here on Santorini black marries white, the sea is as dark as Hades and the sky is azure. Churches and monasteries were built upon the mountain of lava. Domes, vaults and bell-towers in their thousands. The soul of man replied to black with white, interpolating light into darkness, form into chaos, reason into the abyss, God into the demon. There was a need for salvation.